Operating contexts are becoming increasingly difficult and challenging for civil society groups in many countries around the world. Yet even where restrictive legal frameworks are in place, important spaces for engagement exist. In 2013 and 2014 INTRAC conducted desk-based research with the European Association of Development and Training Institutes (EADI) and the University of Portsmouth, with the purpose of informing the Federal Ministry for Economic Cooperation and Development of Germany. The research explored legal and regulatory frameworks in two reports covering 12 countries. The first report, published in July 2013, looks at legal frameworks and political space for NGOs in Bangladesh, Ethiopia, Honduras, Kyrgyzstan, Serbia, and Uganda. The second report, published in June 2014, covers Egypt, Kosovo, Myanmar, Peru, Rwanda, and Vietnam. 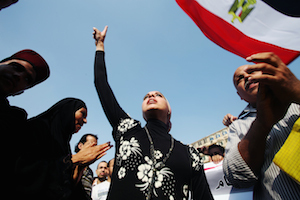 Women’s presence in Tahrir Square during a protest against the Military Trial for civilians. We found that, overall, operating contexts were becoming more challenging, especially for organisations and individuals working on more sensitive issues such as human rights. However, in some countries, such as Kosovo, global rhetoric about enabling space for civil society was trickling down to the national level, resulting in positive improvements in legislation. Improvements are far from universal. Since this research was conducted, civil society organisations in many countries are continuing to face an insecure and unpredictable environment. However, our research found that even in the most complex and restrictive environments, important spaces for engagement often exist, which many of the global-level analyses do not pick up. Through our work on civil society sustainability we continue to monitor the effects of legislation and regulatory on civil society. We drew on our international network of researchers to put together a team with country expertise and robust research skills. The team carried out desk-based reviews of available studies and literature, using a common framework for the country studies. We validated the findings with other experts working on the relevant contexts and within the research team, and came together virtually to draw out key findings across the country studies.